We fabricate an enormous range of Refrigerator and freezers that are made using the most advanced and sophisticated tools sourced from the reliable vendors of the industry. These are available in different models, sizes and colors that are highly demanded for its quality exotic designs and superb cooling systems. Our offer range of these products is available at competitive price. These are provided as per the specifications mentioned by clients. 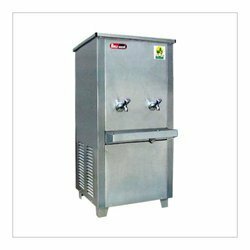 Our organization is engaged in offering a wide assortment of these Water Coolers which find huge application in various hotels, hospitals, schools, colleges and schools etc. These are perfectly used for cooling water and dispensing impure water, which are available in varied designs, sizes and different specifications. * Cooling Capacity 40 Liter. * 200 Glasses/ 1 Hour. * Storage Capacity 80 Liter. * Use For Hospital, School, Temple, Petrol Pumps Etc. * H : 1270 Mm. * W : 550 Mm. * D : 550 Mm. * Stabilizer Req. : 1 Kw. * Also Available In 60/80 Liters. Looking for Refrigerator And Freezer ?